Shorter but trimmer, the former Mediterranean Village is now The Plaza Coral Gables, and Ramon Trias, city planning director, says it’s better for the changes. 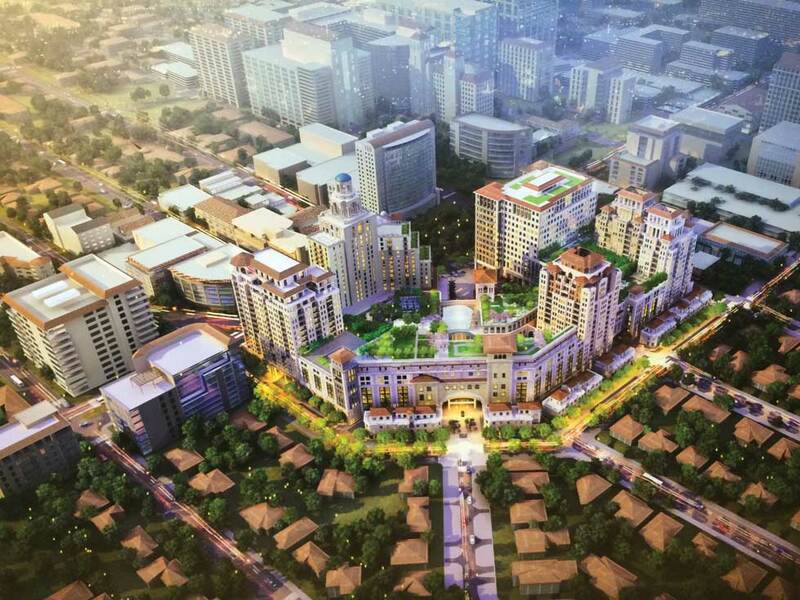 The mixed-use project is to rise at 2801, 2901 and 3001 Ponce de Leon Blvd., just south of downtown Coral Gables. The maximum habitable height was to be 218 feet; that has been shortened to 190 feet. Retail has been reduced from two levels to one, and the hotel component is moving to the rear of the complex, creating an open pedestrian space in front of it, Mr. Trias said. The hotel will have 220 rooms (up from the planned 184) and about 16,000 square feet of meeting space. A 10,000-square-foot fast casual restaurant, a 30,000-square-foot quality restaurant, a gym and movie theater are also part of the new set of plans. The developer also agreed to abandon plans for an underground garage but still will keep a planned 2,408-space garage within the building, with parking to be shared (during different hours) by the commercial and the residential users. The residential component comprises 136 rental apartments (revised from 214 condominium units) and 15 townhouses. Office space has increased from 317,000 square feet to 473,000 square feet. Agave Ponce, the developer, expects to break ground late this year or in early 2018; delivery is anticipated in 2020 or 2021. So the city is forcing them to get rid of the proposed underground parking, so now the parking garage will be larger and people get to stare how a larger empty wall. Why abandon underground parking? The ugliest part of Miami: the massive parking garages with exposed ramps etc. ugh.